The Darker Side of the Moon is a secret kingdom in Super Mario Odyssey, and is the greater location of Culmina Crater. This is also served as the seventeenth and final kingdom overall in the game. It is accessible once the main game is completed and 500 Power Moons have been obtained. This kingdom is the biggest challenge found in the game, with the only Power Moon being found at the end of a gauntlet of challenges based off ones previously found within the game. Completing this challenge rewards Mario with the Invisibility Hat and connects the Odyssey's route from Darker Side to the Mushroom Kingdom, forming a complete loop on the map. Culmina Crater consists of two rocky platforms within a giant crater, which are affected by the Moon's low gravity, and underground caverns that connect the two platforms. The platform the Odyssey lands on contains some local residents cheering on Mario, as well as Pauline and The Super Mario Players, playing "Jump Up, Super Star!" On the other platform is a scale model of New Donk City Hall, with the kingdom's only Power Moon, a Multi Moon, being found at the top of the building. The underground tunnel that connects the two platforms is made up of a bunch of floating platforms suspended above a sea of lava. This tunnel makes up most of the challenge found within the kingdom, being made of a gauntlet of platforming and capture challenges. There are no checkpoints, so if the player dies, they will have to restart from the entrance to Culmina Crater's underground section. However, multiple Life-Up Hearts are found within the stage to help Mario through the kingdom. When things collide, holes are made. This giant crater was formed by a huge meteor collision long ago. The impact destroyed the civilization that flourished on the moon, which is how Culmina Crater came to be. The crater itself is so massive, you cannot see the bottom. From here you can observe galaxies shining in ways you never could see from home. Culmina Crater features vistas entirely unique from those you can find on the Dark Side of the Moon and Honeylune Ridge. If you're feeling down or disheartened, just take a look up at the Milky Way from here. You can see each star twinkle as the nestle close to one another. It will all be OK—you are not alone. The original? A copy? Who knows? This colossal building stands in Culmina Crater. If you look closely, it seems to resemble the city hall in New Donk City. Some think it's based on New Donk City Hall. According to researchers, it might be one of the remnants of the civilization that once flourished on the moon. But with little evidence, this theory lacks credibility. It just sits there. Taunting you. 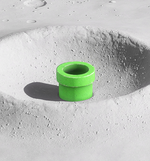 This is the only pipe that connects to the lunar interior. If you find it, we don't recommend jumping right in. What awaits is a trial so harsh, it lives up to the name Culmina Crater. Of course, if you have the confidence of a traveler who has done everything else this world has to offer, give it a shot! Overcome this, and adventurers the world over will sing your praises. The only known photo of the interior. A lava zone spreads throughout this giant cavern. What waits ahead? How far does it go? These answers await those brave enough to enter this unknown, unexplored world. When you look up inside the caverns, you may see deposits that look like the cubic Moon Rocks. Were the rocks that fell planetside originally formed here? See the mysterious building that closely resembles New Donk City Hall. Reach the far recesses of the giant cavern where none dare tread. Test your skills as a hardened tourist one last time. Long Journey's End: The sole objective of the Darker Side. 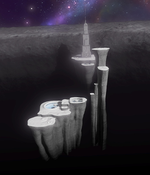 The goal is to clear the areas inside Culmina Crater and collect the Multi Moon on top of the skyscraper. 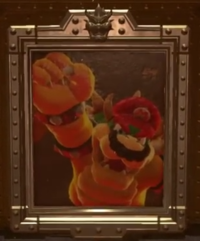 There is only one painting in this kingdom. It is located at the end of the main challenge and it allows Mario to capture Bowser again, taking him to a special course that, upon its completion, will take Mario to the Spark pylons that spells "Thank You", and finally, to the Multi Moon. The Darker Side has yellow Power Moons, in the form of a Multi Moon. Long Journey's End ❸: Obtained by climbing to the top of the skyscraper found at the end of the level. After completing the challenge, Pauline wears Mario's cap instead of her own in this kingdom. Due to a former glitch, it was possible to capture and swim with one of the Frogs found at the beginning through midair, so that the huge abyss between the platform with the starting pipe and the platform with the skyscraper can be crossed to skip the whole challenge part. Inside the challenge part, Mario as Glydon can gain a huge boost in height while entering a whirlwind and slow down the descent by shaking the controllers to fly over the wall with the Bowser painting, skipping all remaining sections of the course. 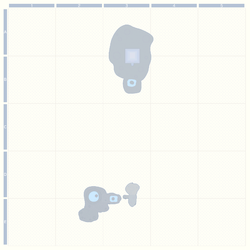 If the player flies too high or too far from the island with the Bowser painting, the player will also be able to skip that section as well, and go directly to the "THANK YOU" section. Rosalina makes a cameo appearance as an 8-bit sprite on a wall on the building at the very end of this kingdom. As Mario makes his journey across the Darker Side, the following Kingdoms' music will play in this order: "Jump Up, Super Star!" (Metro Kingdom), Cascade Kingdom, Sand Kingdom, Wooded Kingdom, Lost Kingdom, Luncheon Kingdom, Bowser's Kingdom 1, "Underground Moon Caverns", and Moon Kingdom, respectively. 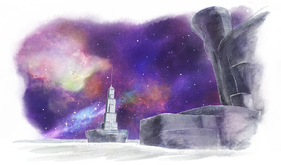 As Mario is climbing the pillar at the top of the building in the area with the Multi Moon, a music-box version of the Fossil Falls theme will play, and will become slower and slower as Mario is climbing his way to the top. This page was last edited on February 23, 2019, at 13:02.